The National Oceanic and Atmospheric Administration is conducting deep sea exploration in and around Wake Island this summer, and the mission has zeroed in on a WWII shipwreck on the ocean floor south of the atoll. 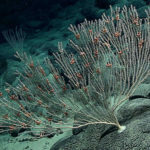 The 24-day mission aboard NOAA’s Okeanos Explorer can be followed at the official website, titled “Deepwater Wonders of Wake: Exploring the Pacific Remote Islands Marine National Monument.” It is a remarkable resource, featuring daily updates, mission logs, audio/video feed, informative background information, and stunning photographs. The Okeanos Explorer departed Guam on July 27 and is scheduled to complete the voyage south of Wake at Kwajalein on August 19. The Explorer headed northwest for the Wake Unit, where it arrived on August 2 and began extensive mapping and deep diving operations. 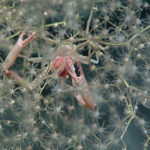 Much of the deep waters and sea floor are uncharted (an astonishing 95 percent of the earth’s oceans are unexplored, according to NOAA) and “virtually no work has been done below SCUBA-diving depths anywhere near Wake Atoll.” This mission is utilizing Remote Operated Vehicles (ROV) for scientific observations in the deep waters –weather permitting – and the ROV cameras are revealing new information on oceanic geology, deep water ecosystems, and long-lost shipwrecks. Telepresence technology includes video transmissions of real-time data to ship and shore-based scientists and the public can follow live streams online. The log shows that during the first successful dives in the Wake Unit last week, the ROV reached bottom as deep as 2240 meters (7350 feet) and recorded coral, sponges, shrimps and more. The vast sea floor is no flat, sandy expanse, but full of seamounts, ridges, mounds and guyots (flat-top mounts). 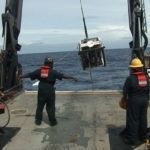 The Okeanos Explorer’s crew solved hydraulic and power problems, but bad weather caused cancellation of at least two days’ ROV dives. The log was quiet after the August 8 cancellation, but came to life again August 10-11 with video feed revealing a WWII-era shipwreck. During Wake Island’s heroic stand in December, 1941, the defenders successfully beat back the first attempted land invasion by Japanese naval forces on December 11, 1941. The Japanese task force steamed toward Wake in the early hours of the morning, but night patrols called the alert and all battle stations stood ready, manned by Marines and civilian volunteers. Under orders to hold fire until the ships approached to within range of the shore guns, the defenders waited in the dark, and then finally let loose on the invaders. While most of the Japanese ships turned tail, the big five-inch guns scored numerous hits and the destroyer Hayate was sunk off the south shore of Wake. Wake’s four scrappy Wildcats strafed and dive-bombed the retreating task force. Earlier this year another NOAA expedition mapped the waters off Wake, seeking to locate the wreckage of the Hayate. Yesterday’s ROV dive headed straight for it and found it immediately, but quickly determined that it was not in fact the destroyer, but the wreck of the Amakusa Maru No. 1. To me that’s not a disappointment at all. In late 1942, the Japanese tanker Amakusa was headed for then-occupied Wake when it was torpedoed by an American submarine, the USS Triton. The Triton was providing support for a night attack of B-24 bombers on Japanese-occupied Wake when it sank the Amakusa Maru, and the submarine had earned five battle stars by the time it was sunk a few months later. But Triton’s first assignment had been to Wake in late November 1941 where a “practice” war patrol turned into the real thing a week later. According to Greg Urwin, author of Facing Fearful Odds, the Triton’s commander spotted the first warship of the incoming invasion force the night of December 10-11, 1941, played “cat-and-mouse” with it for an hour, then took the offensive, firing four torpedoes, “the first shots in the sea battle for Wake Island as well as the first American torpedo attack of the Pacific War.” (Urwin, 315) While the Triton didn’t sink that invading warship in 1941, it took its toll a year later on what is now the ghostly shipwreck in the ROV’s viewfinder. Japan would lose more ships and many, many planes off Wake before the war was over. The deep waters off Wake Island hold many secrets. I will be very interested to see what Okeanos Explorer continues to tell us. All photos are credited to NOAA Office of Ocean Exploration and Research, Deepwater Wonders of Wake. See their fantastic website for many more. Thanks to Tom Gilbert for bringing this expedition to my attention. More than two dozen ophiacanthid brittle stars cling to the branches of a primnoid octocoral colony on “Lafayette Guyot.” These brittle stars are thought to be suspension feeding – grabbing their food from the water column rather than feeding directly on the coral.